How to get the Welsh achievement, and completely wreck England in the process. How to Get the Hero's Welcome Achievement. How to Get the Three Mountains Achievement. How to Get the Buddhists Strike Back Achievement. How to Get the Nagivator Achievement. How to Byzantium in 1.25. A Basic Guide to Colonization. Quick & Simple Fix for Outdated Mods. We're going to go over how to get the Home and Away achievement, which is obtained by being the nation of Wales and owning cores on Cardiff, Dublin, Edinburgh, Rome, Paris, & London. Wales is not a playable nation at the start of the game, which means you will have to release Wales as a playable vassal at some point. 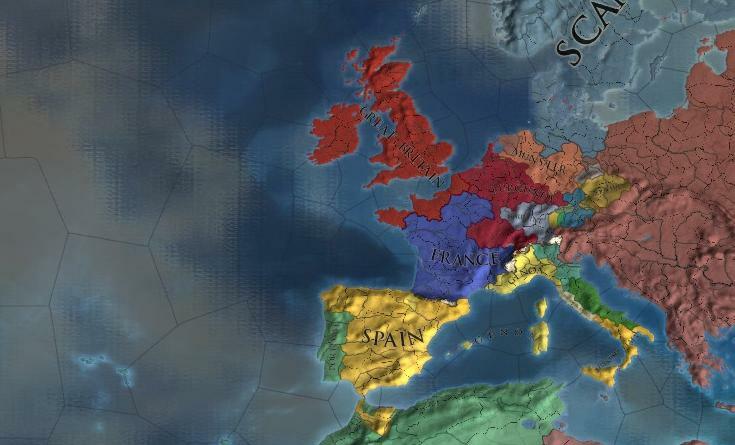 I assume the Paradox developers intended this to be played starting as England, releasing Wales, winning an independence war, then growing and spanning across Western Europe. I did things a little differently. 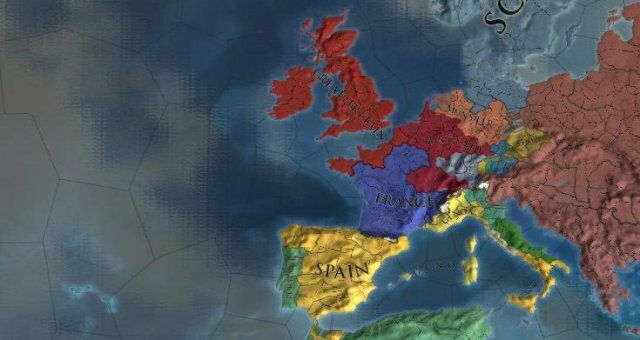 I started as France, took over all the cores I needed to, released Wales as a non-playable vassal, fed them the cores they needed, re-integrated Wales, then re-released Wales and selecting the option to play as the subject nation the 2nd time around. I instantaneously got the achievement. 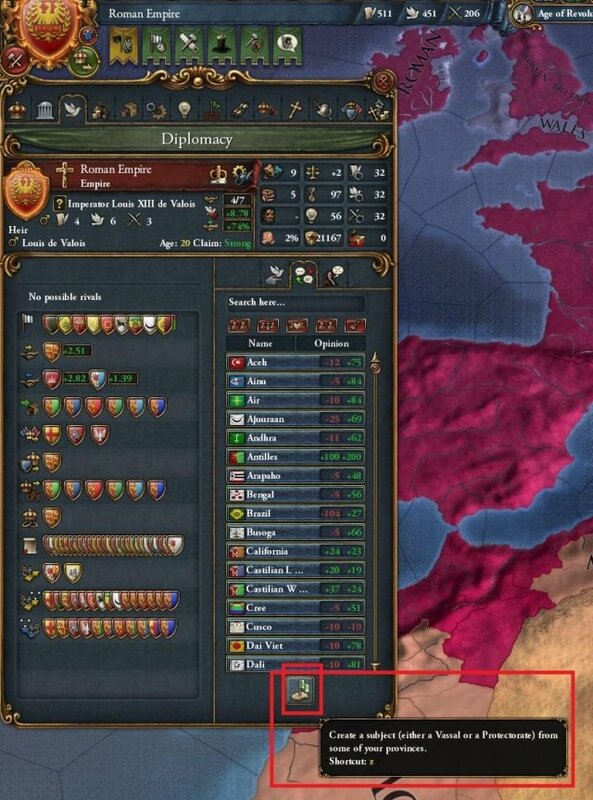 This is, without a doubt, a much easier way to get the achievement than I think Paradox intended, but I can't think of a reliable way this strategy could be nerfed either. Here's a video summarizing what I did, but if you'd like to read the rest of this guide, that works too. First, start the game as France. Revoke your guarantee of Scotland - England will be too busy fighting you and dealing with the War of Roses to attack Scotland any time soon. Do the general opening moves as France where you fight England, siege down every province in Normandy, Gascony, and Portugal if the Portuguese were silly enough to answer England's call to arms. But, here's where things diverge from your typical France play through, when you send England a piece offer make sure that you ask for Meath / Dublin. There are no forts in that area, which means you will receive Dublin for a nominal war score by simply asking. You might as well take some cores too because the best England is no England, and we get there by chipping away at their territory bit by bit. While you're fighting that war, build a spy network on Ulster. Make a claim - you'll use that very soon. You're very next war will be against Ulster. Just ferry your troops across the channel right after the peace deal from the English war. Hopefully you moved against England fast enough that Ulster could not ally England. That should make beating Ulster a piece of cake. While you're fighting Ulster, build a spy network against Scotland. After the war with Ulster, the truce with Scotland should be just about up. You'll want to attack Scotland and take at least the two provinces bordering England. Now you've done something significant - you've rendered the England navy completely irrelevant. The next war you fight with England should be easy - just march your armies around (hopefully while you're at military tech 5) and you should get some stackwhipes. Remember to revoke your guarantee of Scotland right before you attack England. England can't get any new alliances while you are fighting them (as in Ulster, or possibly Scotland). Focus on military monarch points. England starts with a terrible ruler so you can easily get to tech level 5 before they do. You can also afford a military advisor. I did try this strategy with Castile and Aragon, thinking if I got a PU over Navarra and Navarra had a claim on Labourd that I could attack England before France did, grant cores to Navarra, and take Dublin. The possibility of the English noticing Catalan and Sicilian troops amassing just north of the Hadrian Wall was just too entertaining to pass up. Unfortunately, in addition to being extremely RNG, Dublin is outside the coring range in 1444 (which surprised me for Castile), so this didn't work. 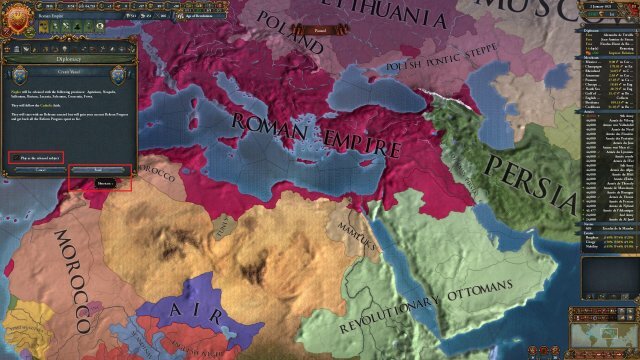 Mid game in this play through will last from roughly 1460 until you get a core on Rome and accumulate a lot of diplomatic reputation. By 1460 you'll have Paris and Dublin, you'll be within a stone's throw of Edinburgh, Cardiff, & London, and the only city you'll really have to do any work to acquire is Rome. I'd recommend chipping away more at England and getting as much diplomatic reputation as you can, since this will require some vassal mechanics shenanigans. Good idea groups would be Diplomatic and Influence. You can check out other idea groups that combine with those first two mentioned to grant additional diplomatic reputation. Then there's always the possibility of hiring a diplo rep advisor or purchasing diplo rep at the Curia. If you really played your cards right you could get the trading in ivory modifier too. It's worth noting that as a Catholic nation occupying Rome you will lose 1 diplo rep, but that's a drop in the bucket compared to how much additional diplo rep you could get. By the early 1800s I had 10 diplo rep despite occupying Rome, which made integrating Wales take 4 years despite the vassal having over 400 development. You could convert to Protestant or Reformed, which would negate the penalty. Before the end of the game, you'll want to release Wales as a vassal. It starts off with a few cores, but you'll want to feed it the cores it needs for the achievement. I initially thought I could just grant cores on the provinces needed (plus one or two provinces to connect Paris to the coast), but it turns out you can only grant a core to a vassal if it's adjacent to a core they already have or if it's only separated from an existing core by one sea province. For example, to grant London I had to first grant Cornwall, then Kent, then London. To get to Rome I had to grant a string of provinces connecting Picardie to Paris to Nice, then grant Sardinia, then Rome. This will give Wales a staggeringly high amount of development, but I did not notice Liberty Desire to be an issue. In fact, it remained at 0% the entire time. There are some age bonuses to nerf Liberty Desire, you should have a ton of diplomatic reputation, and granting provinces temporarily reduces Liberty Desire. Once you release a vassal, you have to wait at least 10 years to integrate them. You'll also want to give yourself a few years to integrate your vassal. I'd recommend giving yourself 20 years just to be safe. The game ends on January 1st 1821. I tested the exploit to see if the game runs past the end date (as it did in patch 1.19), but this exploit no longer works. So if the year is 1800 and you don't have Rome you, you're really running out of time. After you have re-integrated Wales, you'll want to release the vassal again, but this time when you release Wales select the "Play as Subject" option. You'll become Wales, with cores on all the required provinces. As soon as you unpause the game, you'll get the achievement. If you've never played as a released vassal before, you repeat the steps for releasing a vassal but select a checkbox to play as the released nation. It's worth pointing out that Catholic nations that have Rome get an event to return Rome to the Pope and the AI will take this decision 75% of the time. I was worried that by releasing Wales and feeding them Rome that they would return the province, but this didn't happen. It may be the case that the event only fires once, and since I rejected the offer to return the province as France it did not fire again for Wales. It could also be the case that vassals don't decide to return provinces. I can't say for sure that this won't be an issue if you remain Catholic, as I did. If you really have your heard set on playing Catholic France, one option would be to chip away at England, but leave their Welsh cores until after the Protestant Reformation. Once all the Welsh cores are Anglican, Protestant, or Reformed, then conquer the provinces, and make sure you never convert them Catholic. When you release Wales as a vassal, their religion will be determined by the religions in their cores, thus allowing you to play as Catholic France without worrying about whether your vassal will give Rome back to the Pope.